As growth marketers, one of our main responsibilities is to drive growth across the entire customer lifecycle. We design strategies for each customer’s lifecycle stage so that both messaging and creatives resonate with users and eventually lead toward increased engagement, monetization, and loyalty. This process of tracking every stage of the customer buying cycle and maximizing the purchase experience at each stage is called customer lifecycle management. For growth and retention teams, the process provides a framework to anticipate what customers need at every stage so we can communicate with them in the most meaningful way. 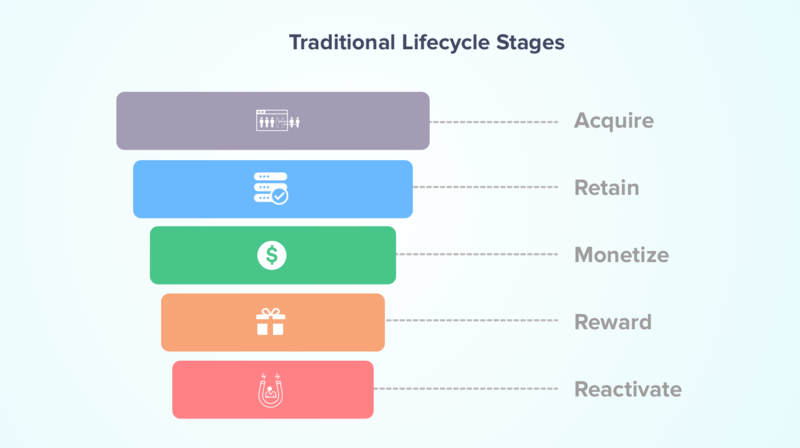 Traditional Lifecycle ActionsTraditional lifecycle models such as this one give marketers a framework to classify user actions. These models break the customer journey into linear stages to identify the best tactic for each stage. Basically, you activate newly acquired users and move them to each succeeding stage in order to monetize them. Another widely used model that attempts to take a more strategic approach to the traditional lifecycle stages above is the AARRR framework by Dave McClure. It allows you to attach conversion metrics to each stage and nurture them with the aim of improving those metrics until they start generating minimum revenue. The existing lifecycle management models have given marketers a way to think of customer journeys and map those journeys to their own goals. However, the biggest question is whether these models keep up with today’s customer lifecycles. The primary reason growth teams are finding traditional lifecycle management models ineffective is that they’re not immediately actionable. For example, it’s good to know that you need to “retain” your users, but which retention strategy will work for a user is up to the marketer to guess. If users are in the Monetize stage, for example, it’s a good indicator that they’re responsive to your product or service. But the hard part is knowing which monetization tactic will work on which subset of users. You might recommend a high value product bundle for your loyal customers since you know their purchase trends, preferences, sizes etc., but the same tactics may not work when you’re trying to get new users to make their very first purchase. 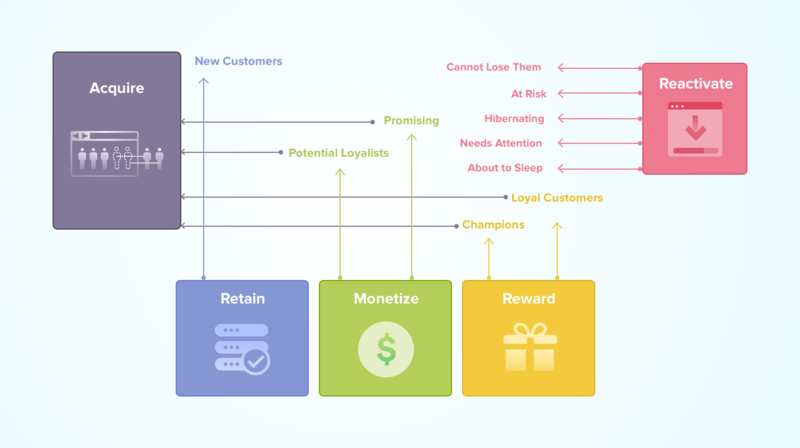 Another drawback is that the lifecycle models force growth and retention teams to follow a customer journey in a sequential manner (i.e., after monetizing a specific user you need to reward them, or after rewarding them, you need to reactivate them). In today’s mobile-centric, hyper-connected world, it takes very little time for customers to switch between stages. One bad experience with your customer support team and that user may transform into your toughest critic. On the other hand, a great experience could propel them to become your advocate within a span of minutes. As a result, brands don’t take the right actions to acquire, retain, monetize, reward, or reactivate users. 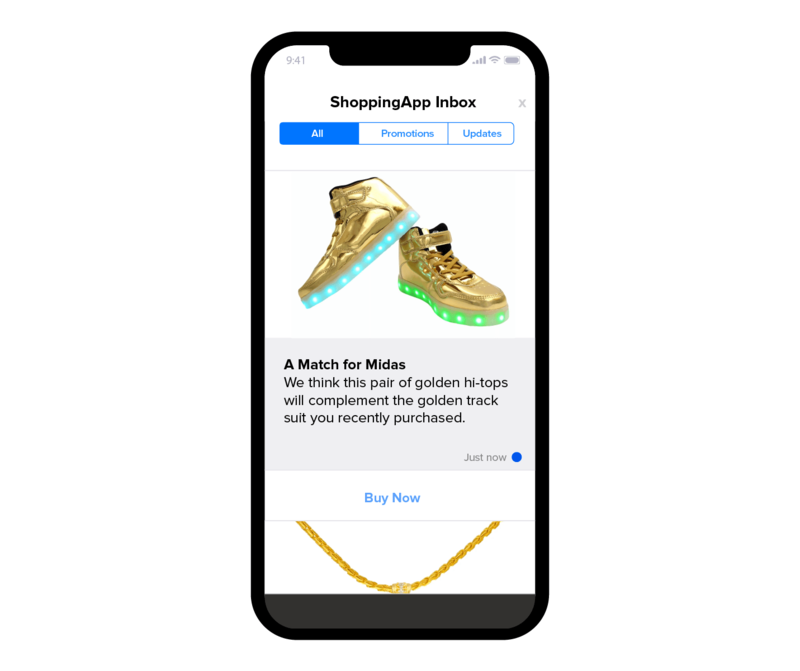 And when they do, they’re generally ad-hoc and broad in nature (e.g., sending a holiday promotion to all users when many loyal users might already be on their path to purchase). To solve the above challenges, CleverTap recommends an innovative approach to make personalized, contextual, and relevant lifecycle management a reality for growth and retention teams. A big focus of this new approach is to make lifecycle management truly actionable for customer journeys of the future. Find The Right User SegmentThe first step is to automatically identify segments of users to engage appropriately: who are the users you should be rewarding, who are the users that need reactivation, who are ideal to monetize, and so on. Once we automatically identify users, the goal is for growth teams to use their creativity and business acumen to engage them effectively. Our Recency, Frequency, and Monetary analysis (RFM) tool makes this a reality. RFM is an automated segmentation tool that identifies distinct segments based on how recently and frequently they interact with your brand. A segment of “champions” on the top right has a high recency, frequency, and monetary score. On the other end on the bottom left is the “hibernating user” segment with the lowest recency, frequency, and monetary values. Similarly, the “cannot lose them” segment of users is high on the frequency meaning they were highly engaged users at one point, but low recency indicates that they’re no longer as engaged and are at risk of churn. “New customers” show high activity on the recency axis and the goal is to bring them up on the frequency axis by ensuring that their activity increases and they become champion users over time. Build The Right Messaging StrategyThe second step is to provide the ability for brands to create “packages” (i.e. campaigns or journeys) that can attach a lifecycle action to every customer segment. For example, you might have different reactivation strategies (journeys) for “at risk” users as compared to your fully hibernating users. Or you might have different monetization strategies for your loyal customers as compared to your first time buyers. The third and final step is a real-time orchestration and automation engine that automatically calculates where each individual user is in her lifecycle. At any moment, this engine is looking to send her a highly contextual package that has been setup in step two above. 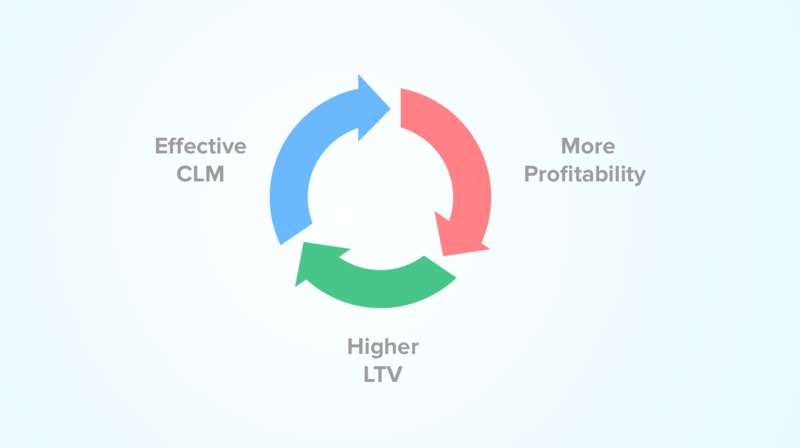 Why Map RFM to Lifecycle Stages for Customer Lifecycle Management? Recency indicates how engaged users are with your brand and in turn is a great measurement of retention. Frequency and monetary values indicate how much time and money they’re spending with you – in essence, excellent indicators of revenue and customer lifetime value (CLTV). A well-rounded CLM process that incorporates automated customer segmentation (RFM) opens up a new world of possibilities for growth teams. It helps identify what actions are optimal for each lifecycle stage: who to send to your loyalty programs, or who to re-engage. As a result, we recommend mapping RFM stages to create a CLM framework as shown below. It allows growth teams to spend more time on optimizing customer experiences and less time doing tedious manual segmentation. It maximizes the revenue potential for each customer while significantly improving the potential for upsell. As every individual customer goes through their own journey, they move up and down the stages. Setting up appropriate packages that are triggered automatically can make marketing more efficient as these require a one-time setup and will always be running as customers enter or exit their journey. New customers are at the bottom of the RFM grid. They’re unfamiliar with your brand but you want to retain them. As soon as they show the attributes of new customers, they will automatically receive onboarding campaigns while giving you more data on them so you can create positive experiences that match their preferences. A newly acquired customer can progress to any lifecycle stage on the spectrum. RFM helps you tell them apart and also identifies what your ideal next steps for monetization should be. For example: promising users are high on recency which means they’re quite engaged with your brand. 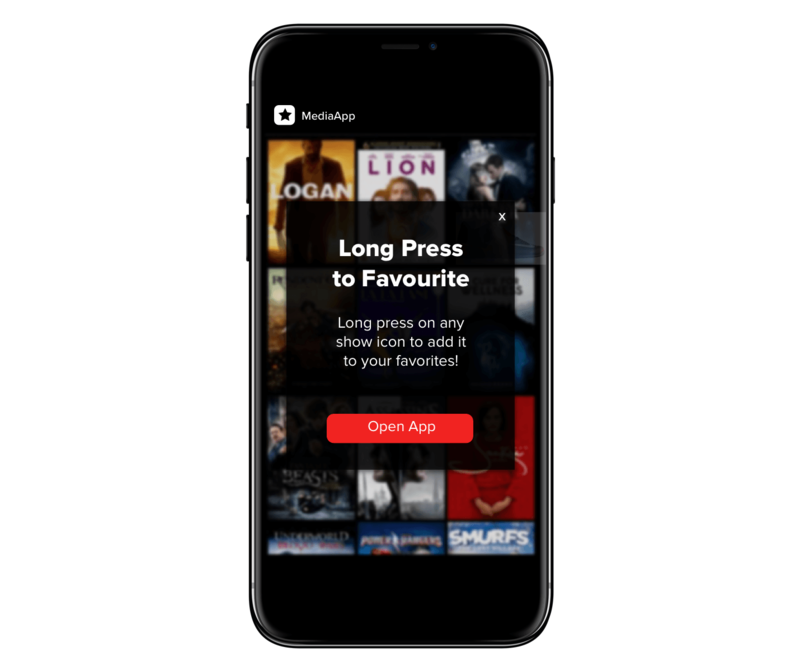 These are great for monetization programs such as bundled deals and cross sells with higher value items. You know them well enough to identify their interests and send customized offers based on their personal preferences. The customers that feature on the right of the grid with high recency and frequency scores also indicate higher monetary value. These are champions and loyal users that likely drive the most conversions for your brand. You must ensure that you continue to deliver positive experiences to them. Champions are ideal segments for any upsell campaigns and referral rewards as they will likely be great advocates of your brand. Loyal customers should be set up for packages that reward them with early access or an exclusive look at your new products or content. 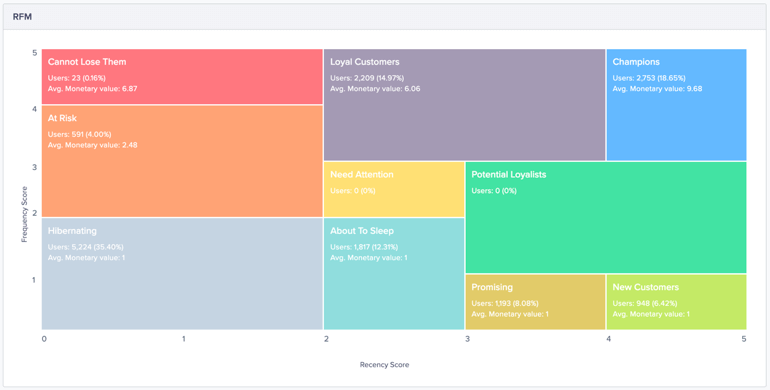 The customer segments that are on the lower end of the recency and frequency grid are: needs attention, about to sleep, cannot lose them, at risk, and hibernating. While these customers may be familiar with your brand, they’re at the highest risk of churn and are ideal candidates for a reactivation strategy such as remarketing campaigns and promotions. With RFM, they’re identified before you lose them and set up for an automatic win back campaign. Check out our product page to learn more on how you can optimize the spend on marketing campaigns and implement a systematic, highly personalized approach to customer lifecycle management.